We absolutely adore how quirky and fun this feed is from Seattle stylist Shelby Edwards! Another Mexican marvel in my eyes and a whole lot of pretty pink pictures to blow your mind! You didn’t think we could go through this list without shamelessly plugging our own colourful account did you?! The queens of colourful sure know how to rock Instagram! These babes regularly share their favourite bright snaps from their hashtag #ABMlifeiscolorful too! If you want a whole lotta fun with a whole lotta colour then Kelly Lanza from Studio DIY is your girl! She also has some of the best DIY projects we’ve ever seen! A designer, crafter, stylist and blogger photographing beautiful colourful crafts and tutorials! If you love interiors, decorating, design and beautiful photography then you’ll love Passion Shake! With a name like Bright Bazaar you know you’re getting what it says on the tin with Will Taylor’s Instagram account! Bath bombs, fruits, sweets and the colourful in the everyday life is what you can expect from Team Wood Note! Bright, bold and beautiful. Just the way we love it! If you like rainbows, then you’ll love Aurely Cerise! This adorable pink haired babe is all about the fun with her Instagram, there’s a healthy dose of cute thrown in too! Basically a collection of the most awesome and colourful cookies EVER!! Another pink haired beauty with a very pink toned Instagram! Expect to see lots of awesome fashion posts, epic nail art and her two adorable doggies making appearances too! Sugar and Cloth are one of our favourite DIY blogs and their Instagram is one of the most colourful we’ve ever seen! If you love colourful crowns and hair accessories then Sophie from Crown & Glory is your girl! Her feed is full of so much pretty for your hair! Another fab and colourful DIY blog sharing beautiful content and crafts! We absolutely adore everything about Brit + Co, the backdrops, the balloons and obviously the puppies! Leslie is a fashion blogger who appreciates the colourful outfits in life as do we! She also shares fun quotes and plenty of thrift store finds! A blue haired bombshell who’s as obsessed with weddings as we are! Her Instagram is full of quirky finds, pretty selfies and one of the most beautiful cats we’ve ever seen! Prints, stationery and paper fun all topped with a healthy dose of PINK! A pastel and pretty loving princess (often quite literally!) featuring beautiful outfits, dainty things and plenty of Disney cosplay! Was that an explosion of colour or what?! Judith in Wonderland blows our mind! Clare Nicolson’s feed is definitely one of my faves! It reminds me of something retro yet somehow modern?! I don’t know if that makes sense but it’s basically awesome. Fun DIYS, travel snaps and plenty of colourful creativity to sink your teeth into! Holla! A pretty pastel Instagram from Spain. It’s random, it’s cute and their twins are adorable! SO MANY COLOURFUL BACKGROUNDS! How awesome?! ELO has a super modern and simple, clean feed. It’s also very, very beautiful. It’s faces made of food, on colourful backgrounds…What more do I need to say?! Kim is a photographer based in LA and if you’re looking for a feed that will brighten up your day, this is it! Another colourful fashion & lifestyle blogger for you now who looks particularly pretty in pink! If you love scrapbooking then Studio Calico is for you! I’m part of their monthly subscription too and the crafting goodies they send are the bomb! Stripes, spots and many more beautiful and bold patterns in Design Sponge’s Instagram feed! An artist with an eye for colour, flowers and IS THAT A UNICORN?! You’re goddam right it is. Ahhhhh Cluttercuss, where do I even start?! It’s like my mind has been pulled out and snapped all over this Instagram! The colours are awesome, there’s flamingos and just the right amount of watermelons and cacti! Meandering Mari is very much about the watercolour! I absolutely love when she photographs her leftover paint and asks people what you can see too! It’s like spotting shapes in the clouds but WAY prettier! More gorgeous paint and designs from Wildhum! They look particularly fab in art prints too! I LOVE THE CRAFTED LIFE! And I also love those socks. And I’m pretty sure I need that neon sign in my life too! Plenty of flowers, sprinkles, balloons and lots of gorgeous styling over on Little Big Bell! Flashes of delight, inspiring you to shine bright! If you don’t already want sprinkles for breakfast then this Instagram feed will have you waking up with a sweet tooth! I can’t think of Kate Spade without thinking of bright pops of yellow so obviously this Instagram account does not disappoint! I absolutely adored San Fransisco when I visited and this beautiful stream makes me want to return ALL THE TIME! Especially with all of those colourful houses being shared! Eeek! I am in love with Design Love Fest’s Instagram, the styling is always INCREDIBLE and she definitely has the same love of bright pops of colour like Bespoke Bride! At Pretty Blog is another absolutely gorgeous stream of flowers, macarons, paint and pretty! An inspirational feed filled with uplifting quotes for creatives! Daily lifestyle and recipe inspiration all topped off with a sprinkling of glitter and a frosting of pink! Brittany Wood is a fun and creative photographer based in LA sharing the beautiful in the everyday! Founder of the epic Shop Bando (See below!) and hilarious, fun loving gal! Olivia is a globetrotter with an eye for colourful buildings, bright doors and bold patterns! Mark’s stream is a beautiful collection of random items intertwined with colour, you’ll often see him playing with mirrors, fruit and even butter! Sweeties, pancakes, cute hamsters and even teeny tiny bunting are some of my favourite things about AnaBlizz’s feed! Vanessa’s instagram makes me love pink even more (if that’s possible! ), I love the little pops of it inner stream! A DIY, party and food feed crafted by a sprinkle-obsessed graphic designer! BOOM! Told you Shop Bando was coming up and you would not be disappointed! These beauties specialise in gifts, hair accessories and all sorts of FUN! 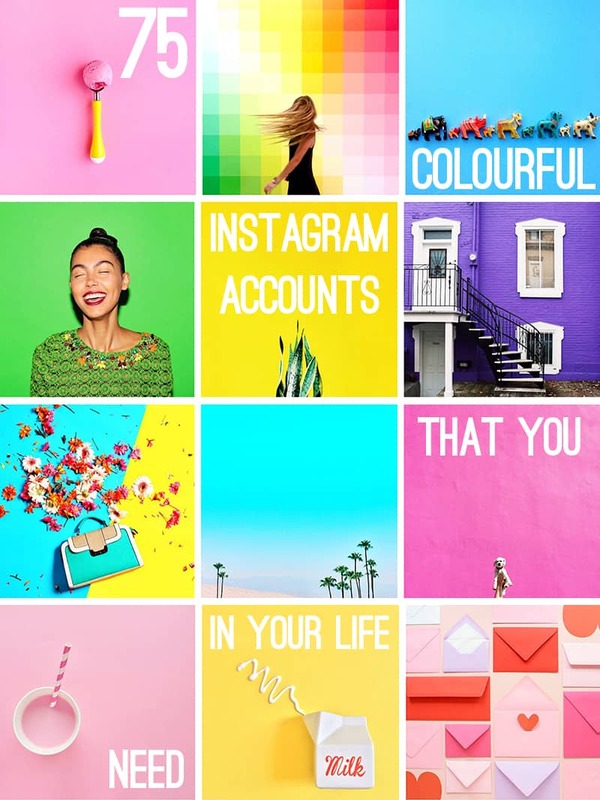 Here’s another beautiful and colourful Instagram feed! Tiffany also finds and photographs awesome pink houses in Buffalo! Check out #pinkhousesofbuffalo to see them! A daily dose of pretty and a glimpse into their adventures and inspirations! Shop Bicyclette is city life with a whimsical twist! Random Acts Of Pastel is pretty much what it says on the tin, tons of pretty pastel pictures from lovely life! Eat Drink Chic is full of fun DIYs and printables for those special occasions! There’s also some pretty sweet iPhone wallpapers! A daily feed with a focus on design, fashion, food, and joyful moments from everyday life! Amy Stone is an admirer of fresh flowers, gallery walls and is constantly inspired by Californian surf and 1960’s palm beach! A creative blogger, maker, adventurer, lover of beautiful things and beautiful times! On trend stylish party and event suppliers in Australia with healthy doses of confetti, tassel garlands and pretty party bags! I absolutely love the cute stationery and planner stuff that Design Is Yay creates and shares on her Instagram! Magic maker, constant inspirer and women empowerer! Gala encourages radical self love through her colourful Instagram stream! As if the A Beautiful Mess stream wasn’t colourful enough, Elsie has her own explosion of colour on her personal account too! I Heart Blog Shop is the winning combo of Design Love Fest and Angela Kohler, they teach photoshop classes for bloggers and as you can imagine, their Instagram is all sorts of beautiful! Tiny frames full of colour and adventures in London and beyond! Painter and textile designer with an eye for colour! I particularly love how pretty the designs look on clothing! Pretty cups, mugs, stationery and even a few piñatas thrown in to mix makes Pineapples and Coffee Cups a great account to follow! Tula is the gal behind the graphic design blog Whorange and her feed is full of magic, unicorns & confetti! Another favourite featuring block colour backgrounds, quirky items and lollipops! Beautiful stationery from a designer and wedding lover! We absolutely adore Gubba Gumma’s work and her Instagram! And last but certainly not least, Leslie Wring’s feed is a super collection of lovely trees, colourful buildings and her life on Vancouver Island. There are some great account for inspiration in this list! The colors killed me! Wow, what a great list guys (75!) So many old, colorful friends and so many new to follow. Thank you so much for your kind words Aga, we are so glad that you like it and it was our pleasure to include you in the list, your Instagram is amazing!! What a gorgeous selection! Love to see some fellow bloggers in there and so many accounts that are my everyday vitamins. The pleasure was all ours we absolutely loved putting it together! Love your Insta!! It really was our pleasure Holly. Absolutely adore your Instagram!!! massive thanks girls …. This is EXACTLY what I needed! Nice list of fabulous colourful accounts love them all!